Today cloud-based services pervade every part of the institution. They are used for learning, billing, healthcare, housing, maintenance, and everything in between. You also recognize that the successful adoption of and mitigation of help requests for this growing number of solutions mandates a central authentication policy. So what do you do? Even knowing full well the security risks and management overhead that comes with opening your organization up to these services you are pushed to create holes in your firewall and invest an inordinate amount of energy working with vendors and maintaining ever changing configurations. In other words your security fortress now looks more like Swiss cheese. 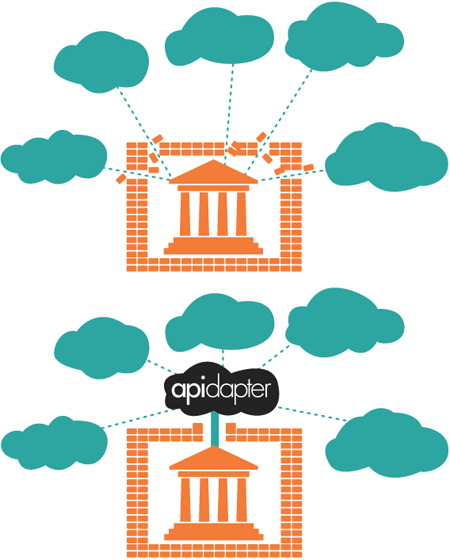 Apidapter offers a better way. As the “gateway” for your cloud-based services you can consolidate all your authentication needs into a single point of entry. This immediately eradicates vulnerabilities, reduces operational overhead, and makes it trivially easy to bring on and manage new services. When it comes to the growth in cloud-based services, there’s no end in sight. The question is, can you stay ahead of the curve?